The Rebel Sweetheart. : Improve your luck, or make your own. My Mum has this penchant for zodiac signs, psychic readings, and feng shui ornaments for as long as I can remember. So imagine her joy when she received a Laughing Buddha figurine on her 50th birthday. It was a gift from my parents-in-law, and the figurine looked something like this. One of the most popular symbols in feng shui, the Buddha has always been associated with abundance and prosperity. Feng shui experts often suggest having a Buddha inside your home - be it a small figurine or a three-feet statue. Having one, so the experts say, entails money, success, and good luck. This Laughing Buddha, however, not only attracts wealth, it also ensures the owner happiness and peace in his or her life. Legend has it that the Buddha is most pleased when he sees people transforming their problems into happiness. It is said that the Buddha enjoys scooping up all the unhappiness, problems, and worries of human beings and stuffing them all inside his big bag. Here you see the Buddha holding an inglot with his left hand, while carrying gold coins, another symbol of wealth, with his right. 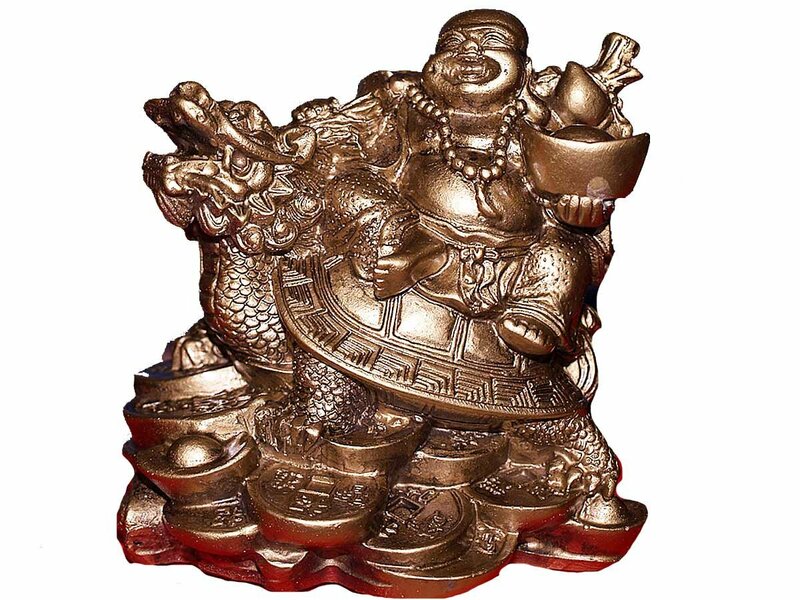 The Dragon Tortoise, which the Buddha is riding on, also symbolizes wealth and prosperity. This legendary symbol combines the powers and attributes of the dragon and the tortoise - two of the four spiritually endowed creatures of Chinese symbolism. It sure would be nice if we can acquire all the good luck that these ornaments bring. Of course, we shouldn't rely on them alone. You know what they say, luck is a dividend of sweat. The more you sweat, the luckier you get.